Our artist-client wanted a romantic, flowery "cottage garden," in cool and pastel shades. 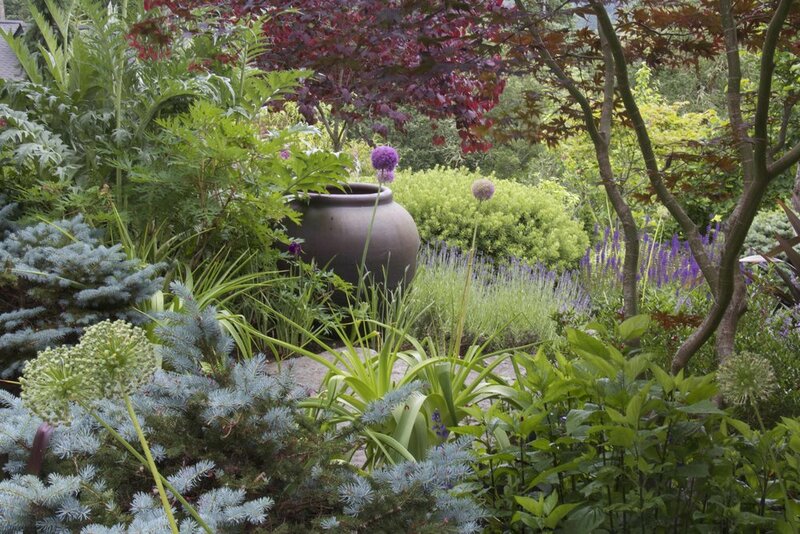 Her original planting, largely thuggish ornamental grasses and traditional landscape shrubs, had never been quite what she wanted, and she was hoping for something more in keeping with her craftsman house and painterly aesthetic. Mosaic constructed the Suncatcher landscape in stages, learning the site and the tastes of its deer over time. A large Vietnamese urn and basalt pathways were our additions to the existing hardscape. As we moved into new phases of the garden, we adjusted our planting style to accommodate lessons learned and changing preferences. Where spring color was our client's first priority in the beginning, she came to love plantings that provide year-round impact. Over time, we have created a space that looks fabulous in every season, reflecting the cottage garden aesthetic, and accommodating the ever-changing tastes of the local deer.